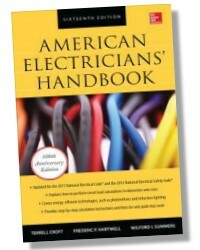 The #1 Guide to the 2008 NEC® to Ensure that Electrical Work Passes Inspection on the First Try! 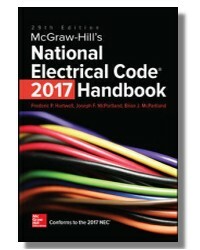 Completely revised and updated to reflect all 2008 Code changes, McGraw-Hill's National Electrical Code® 2008 Handbook, 26th Edition provides the essential put-the-code-into-practice guidance that users require in the field and in the office. An industry bestseller for over 85 years, this classic handbook helps decipher and interpret new Code changes and difficult and controversial rules. With the new addition of Frederic P. Hartwell to the author team, this time-tested reference has been rigorously revised and rewritten to cover all the information needed to meet 2008 Code requirements. Covering every topic in the 2008 Code, the coverage ranges from grounded conductors, branch circuits, feeders, surge arresters, wiring methods, cables, conduits, and switches…to hazardous locations, emergency systems, communications circuits, and product safety standards. • Requirements for Electrical Installations • Branch Circuits • Feeders • Services • Surge Arresters • Wiring Methods • Cables • Conduits • Tubing • Busways • Wireways • Raceways • Fixture Wires • Switches • Appliances • Generators • Capacitors • Storage Batteries • Hazardous Locations • Temporary Wiring • Emergency Systems • Communications Circuits • Tables • Examples • And Much More! Brian J. McPartland is an electrical consultant and educator who teaches the nuts and bolts of the National Electrical Code®. He is coauthor of McGraw-Hill's National Electrical Code® Handbook, 25th Edition. Joseph F. McPartland is an electrical contracting consultant and coauthor of McGraw-Hill's National Electrical Code® Handbook, 25th Edition. Frederic P. Hartwell is a working electrician, President of Hartwell Electrical Services, Inc., and has been certified by the International Association of Electrical Inspectors as a Certified Master Electrical Inspector. He is a senior member of NEC® (Code Making Panel) CMP 9. He is coauthor of McGraw-Hill's American Electricians' Handbook, 15th Edition. National Fire Protection Association, NFPA, National Electrical Code, NEC, NFPA 70, and NFPA 70E are registered trademarks of the National Fire Protection Association. All NFPA trademarks are the official property of the National Fire Protection Association. 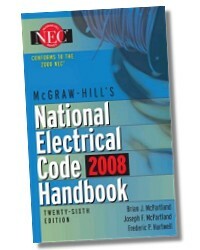 McGraw-Hill's National Electrical Code® 2008 Handbook is not affiliated with, authorized, endorsed by, or in any way officially connected with the National Fire Protection Association. 1583 Pages - 6 x 9-1/4 in.